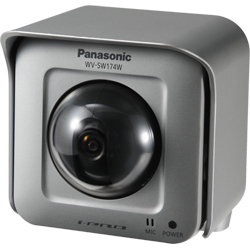 The WV-SW174W is a compact, wireless, pan-tilt network camera perfect for installations where cost-effectiveness is necessary without compromising performance. 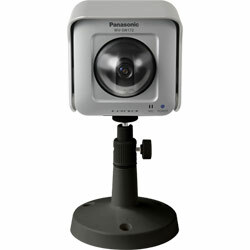 Wireless LAN function (IEEE802.11 n/g/b) : Camera images can be monitored over a wireless router. 1.3 Megapixel high sensitivity MOS Sensor 720p HD images (1,280×960) up to 30 fps. Multiple H.264 (High profile) streams and JPEG streams ensure simultaneous real time monitoring and high resolution recording by “UniPhier®”. High sensitivity Day & Night (Electrical) function: 0.6 lx (Color), 0.5 lx (B/W) at F2.2. 2x extra zoom at VGA resolution 8x digital zoom controlled by browser. 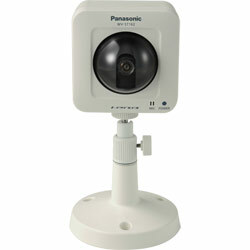 VMD (Video Motion Detection) with 4 programmable detection areas 15 steps sensitivity level and 10 steps detection size. SDHC/SD Memory card slot for manual recording (H.264 / JPEG), alarm recording (H.264 / JPEG) and backup upon network failure (JPEG). 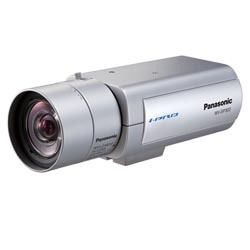 Interactive communication with audio: By using the audio output connector and the microphone in connector, receiving audio from the cameras on a PC and transmitting audio from the PC to the cameras is possible. 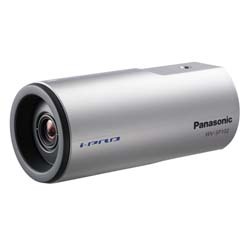 IP55 rated water and dust resistant. Compatible with IEC60529. WPS (Wi-Fi Protected Setup) function.